Andrew Speight is a clear-toned, hard driving alto sax player, one of the Bay Area's most lively and lyrical exponents of straight-ahead, joyous jazz. A native of Sydney, Australia, Speight came of age playing with American stars like Percy Heath, Nat Adderley and Benny Carter as they passed through town. 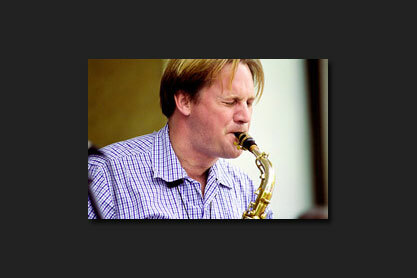 His 1998 CD, Andrew Speight Quartet, won an Aria Award, the Australian version of a Grammy. Speight has been in the U.S. since the early 90's, leading jazz programs first at Michigan State University and now at San Francisco State. But most importantly, Speight has been blowing the doors off of every joint lucky enough to have him on the bandstand. Speight appeared with legendary drummer Jimmy Cobb on this year's highly acclaimed CD, Marsalis Music Honors Jimmy Cobb, released by the record owed and run by Branford Marsalis. Andrew Speight's early introduction to the jazz world of Sydney, and the world at large, was facilitated by the fact that his father, John Speight, was a jazz pianist and his mother, Niddrie Wauchope, was a singer. Big name American jazz players would often come through on their own and pick up local backing bands, and Speight's father would frequently get hired and bring his son along to observe. Some of the musicians coming through included greats like Sonny Stitt and Johnny Griffin. “When I was 14,” Speight told JazzWest, “I got to hear Sonny Stitt, who gave me an informal lesson. I'd give my right arm to be able to have that lesson again. As Speight grew to adulthood, he started his own band, “Now's the Time,” to perform the Art Blakey-style straight ahead jazz he had grown to love. After touring with Nat Adderly, Joe Williams and Louie Bellson, Speight came to the U.S. in 1991 to compete in the prestigious Thelonius Monk International Saxophone Competition, where he was the only non-American finalist. He went on to join the jazz faculty of Michigan State University, collaborating while there with Branford Marsalis, Jimmy Heath and Benny Carter. He moved to San Francisco to join the SFSU faculty five years ago. Since arriving in the U.S., Speight has performed at major venues and festivals and performances around the world with the likes of Wynton and Branford Marsalis, Milt Hinton, and the Lincoln Center Jazz Orchestra. Speight has developed a distinct, lyrical style. His playing draws inspiration from Charlie Parker’s classic sound while reflecting his own unique perspective. The result is distinctive and compelling--at once vintage and fresh, elegant and articulate. Andrew Speight peforms at Jazz at Pearl's with a tremendous ensemble including rousing and original pianist Joe Gilman, trumpeter Tom Pirrone, bassist Michael Zisman and drummer Matt Guggemos.